During the late 1940s progress continued on this tank, and after some false starts an improved version was offered as the IS-8. This tank managed to pass all tests and was accepted for service, but between the time it was accepted and the first tanks rolled out in 1953 Stalin died, so the new tank was redesignated T-10. In the meantime Western ammunition gun and munitions development had found easier ways to defeat this tank, as it only had monolithic armor protection. The new sabot (APDS) and antitank (HEAT) rounds and guided missile warheads could all defeat its armor from the frontal 60 degree arc, so the tank was no major threat. 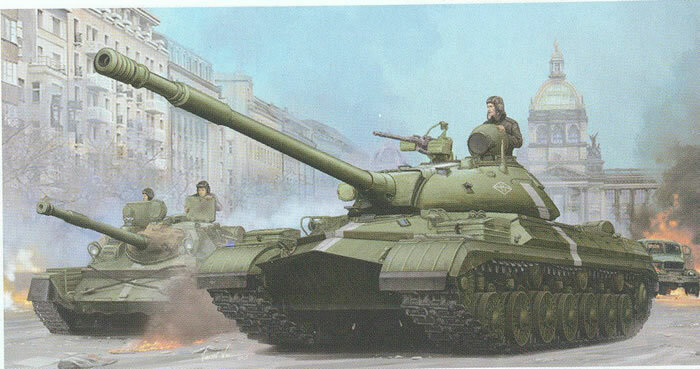 With the advent of the Article 432 (later T-64) tanks on the horizon, less than 1,600 T-10s of all types were built. Oddly enough, the tanks were built by two factories - the Leningrad “Kirov” factory and the Chelyabinsk “Kirov” factory (later Chelyabinsk Tractor Factory after 1958). Production in Leningrad ceased in 1962 and in Chelyabinsk in 1966, but both factories - neither one liked the other’s work - made slightly different versions of the same vehicles. Some resin kits from companies like Navigator and Brigadyr in Russia and Commander Models in the US have come out over the interim period of time, but now two brand-new kits have been released at the same time by Meng and Trumpeter of the final variant, the T-10M. But both kits are slightly different, and with the fact that two different tanks were built it appears at first glance they each used a different preserved vehicle as their source. But without detailed analysis and serial numbers it is not possible to determine which kit represents which factory! This kit is the simpler of the two as it uses simple “stick them together” single link tracks, one set of links for the left track and one for the right. Meng uses three-piece ones which you either love or hate based on success, but this one is old fashioned if tedious. I wish they had followed the very useful track sets in their KV series of kits with “link and length” with premolded droop. Having converted two Trumpeter IS-3M kits into a T-10M back in 2008 I did a great deal of research on the T-10M and can comment reasonably well on this kit. It starts out with the lower hull (as do most tanks) and all of the suspension components are separate items. Six of the road wheel axles are fitted with shock absorbers and fluid reservoirs which is correct. As Trumpeter apparently is going to share these molds with other kits (the tracked SCUD launcher already being announced, which uses a large number of T-10 parts) separate driver faces are used by this kit. The next steps cover the turret, and give the modeler the option of either leaving the turret smooth or adding the bustle bin to the rear of the turret. This comes with a separate hatch and details. Oddly enough the coaxial KPVT machine gun was molded in the middle of the sprue so its conspicuous flash hider must be hollowed out by the builder. There is no mantlet cover (the actual tanks were fitted with a canvas cover, which the builder will have to add from putty if desired) but all other details appear to be present. The commander’s cupola consists of 19 parts and looks the part; “clear” part fans will be disappointed as all parts are solid. The M-62T2S gun barrel comes in four parts – two halves and two collar haves. Care will be needed in smoothing the multibaffle muzzle brake but the rest should be easy with a “Flex-i-File”. A large 14.5mm ammo can stores on the right side of the turret. The only error I have found so far is that for reasons best known to themselves Trumpeter shows the tank fitted with four smoke canisters; this is not right, as all of the photos of the ones in Czechoslovakia were fitted with two 200 liter auxiliary fuel tanks carried at the rear (and some had two extra ones tossed on top of the first set. The fuel tanks are carried low and the smoke canisters mounted high, but you will have to find a suitable donor. The Trumpeter IS-3M comes with the tanks and the mounting racks which should fit here. Other minor details are missing but in most cases understandable. There is a small line leading from a side boss on the rear external fuel tanks (E-28/29) into the tank at the front outside corner of the rear engine deck plate. Both the bosses for this line are missing. Also missing are a part of D-shaped towing clevises on the left side glacis behind the single headlight. This tank is fitted with the grillwork over the top of the exhaust openings (the smaller outer grills on the engine deck with covers PE-D2). Others are not but the grid pattern inside them is quite different so the PE parts should be used. The KPVT machine gun is OPTIONAL - only one in five T-10M tanks was ever fitted with the weapon. The one in the kit is very nicely done - but it is missing the predictor gun sight fitted to most of those tanks with this weapon. Note that the gun requires both an ammo box and a connector/casing collector box on opposite sides of the gun. Four finishing options are provided: 95th Heavy Tank Regiment (TTP), 9th Tank Division, 1st Guards Tank Army, Plzen, CSSR, August 1968 (dark green with white “cross” stripes and diamond markings - either 5-10 / 37 or 23 / 3-4); Unidentified Guards Unit (overall green with Guards badges); Unidentified tank regiment, Unidentified Heavy Tank Division (green with diamond marking and white 202). A “Number Jungle": sheet with targeted markings is included. Overall, other than the curious errors noted in the review this is a very well done and simple build with less etched brass than many recent Trumpeter kits.